LAS VEGAS and ATLANTA, Aug. 9, 2018 /PRNewswire/ -- Scientific Games Corporation (NASDAQ: SGMS) ("Scientific Games" or the "Company") congratulates the Pennsylvania Lottery (the "Lottery") on its record sales of $4.2 billion in fiscal year 2017-18, driven by a record $2.8 billion in instant Scratch-Off game sales, investment in technology innovation and new game entertainment products. The Lottery also awarded a record $2.7 billion in prizes to winners. More than 9,300 Pennsylvania Lottery retailers, many small and family-owned businesses, earned $224.1 million in sales commissions, up $12.7 million from the previous year. Fiscal year 2017-18 marked the seventh consecutive year the Lottery generated more than $1 billion in profits for senior citizen programs in the Commonwealth of Pennsylvania. "We are very grateful for the support of our business partner Scientific Games over the last decade, from highly successful instant games, to the technology innovation the company invested in to help us modernize with our popular mobile app and convenient new point-of-sale programs like cashless lottery payments and player self-service machines," said Pennsylvania Lottery Executive Director Drew Svitko. Svitko said it was important to note that the company quickly brought Keno and iLottery online/mobile games to market near the end of the fiscal year, which contributed to the Lottery's success. The first full fiscal year of sales for new Fast Play games exceeded estimates. Along with Virtual Sports (coming summer 2018), the launch of these new products is part of the Pennsylvania Lottery's strategic plan to offer new game entertainment that will continue to grow revenue to benefit older Pennsylvanians. Accounting for 67 percent of sales, in fiscal year 2017-18 the Lottery's instant Scratch-Off game revenue totaled a record $2.8 billion, up 3.6 percent from the previous fiscal year. Draw game sales totaled $1.25 billion, up 2.9 percent from the previous fiscal year. Popular new Fast Play games totaled more than $114.4 million in the first full fiscal year of sales. 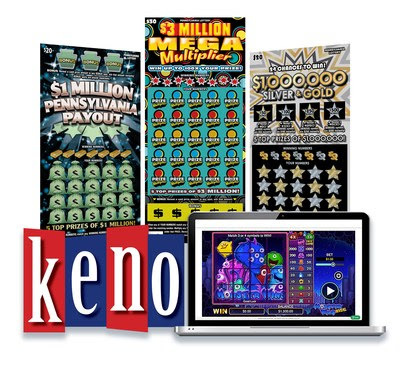 Keno, which went on sale May 1, generated more than $7.6 million in sales. New iLottery online interactive games, which launched May 22, were responsible for $20.8 million in play through June 30. The launch of the Pennsylvania iLottery program is considered the most commercially successful to date in the U.S.
"Scientific Games has a long history of investing in innovative games, technology and services that maximize Lottery funds to benefit older Pennsylvanians. We are proud that our partnership with the Pennsylvania Lottery has resulted in one of the highest performing lotteries in the world," said Pat McHugh, Senior Vice President, Global Lottery Systems for Scientific Games. As part of the iLottery launch, the Company also launched a unique affiliate program with Pennsylvania Lottery retailers to encourage players to sign up for iLottery. Games sold in stores will continue to be the foundation of its business and proceeds to benefit older adults. Since 1972, the Pennsylvania Lottery has contributed $29 billion to programs that benefit older Pennsylvanians including property tax and rent rebates, transportation, care services, prescription assistance, and local services including senior centers and meals. A supplier to more than 150 lotteries globally, including nearly every North American lottery, Scientific Games is the world's largest supplier of lottery instant games and known for its expertise in complex, integrated systems technology implementations. The Company is currently the fastest growing lottery systems supplier in the U.S., and the leading lottery systems supplier in Europe.